The obvious use for a home battery is to store surplus electricity from solar panels for later use. Depending on the size and orientation of your solar array, and indeed on your household consumption, you can fully charge the battery during the day and then use the power when it is required, rather than let it all export to the electricity grid for little or no reward. Households on Economy 7 tariffs pay two different prices for their electricity. For seven hours during the night they are charged a cheap ‘off-peak’ rate for their electricity. This is usually used to heat the water cylinder, night storage heaters and more recently, charge electric vehicles. 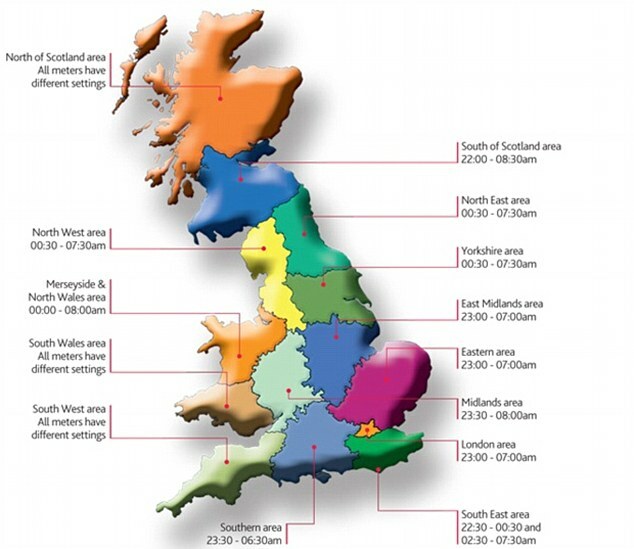 The actual off-peak times vary by region – for homes in the Electricity Northwest region it’s 00:30 until 07:30. The different times are listed on the map to the right; click on it to enlarge. The downside of this is that a more expensive tariff is paid for usage outside these times. Solar panels reduce the electricity bill of any household during daylight hours, which is especially good for those on Economy 7 as their peak rate electricity bill is reduced. The storage of surplus solar electricity is particularly valuable to those on Economy 7 tariffs. This is because they will be using the stored electricity during late afternoon, the evening and into the night, before the off-peak period begins. The majority of battery storage systems offer such benefits. Some of the better quality systems also allow the stored electricity to be used during the day when demand exceeds solar generation, for example on intermittently cloudy days, or when high-usage appliances are used. This further reduces the electricity bill. During the winter months we have less sunlight and therefore the solar electricity generation is lower. The majority of battery storage systems will hardly be used during this period. However, Powerwall 2 has another trick up its sleeve. Powerwall 2 can be programmed to automatically charge from the mains during the off-peak electricity times. This allows the household to use cheap rate electricity during peak rate times. If there is surplus solar electricity during the day then it will still charge the battery and reduce the electricity bill.